Gordon Coxon spent the early part of his musical career as a drummer and percussionist working with such luminaries as the mime artist Lindsay Kemp, the Velvet Underground's John Cale and punk star Toyah Wilcox. Highlights later include running an improvising electronic jazz combo, The Space Cadets; releasing a solo electronic jazz-inclined album, 'Zeros for Heroes'; and collaborating with Shamanic poet Odi Okaka Oquosa on the CD 'Alchemy of the Soul Transforming'. More recently Gordon began composing and recording what he calls 'organic' music, sometimes incorporating sounds of nature, notably birdsong, and utilizing a variety of traditional instruments, including pipes, harp, shruti, frame drum, singing bowls, crystal bowls, amongst many others, plus occasional vocal and other authentic samples and, of course, gongs. Gordon was drawn to the gong more than 15 years ago through a deepening involvement in yoga and meditation and it has since become his main sphere of interest. 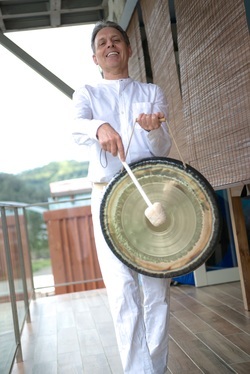 He studied for many years with Grand Gongmaster Don Conreaux - the world's foremost authority on the gong - and when in the UK offers gong baths regularly in group sessions and on a one-to-one basis in London, Brighton, across southern England and elsewhere. Gordon now divides his time between the UK and Taiwan, where in 2016 he launched Sonic Blessings, an East meets West, yin meets yang, adventure in sound with partner Yi Ling Chao. Gordon and Yi Ling integrate yoga, meditation and sound healing as they explore the universal resonate power of the gong worldwide through gong baths, workshops, training and retreats.